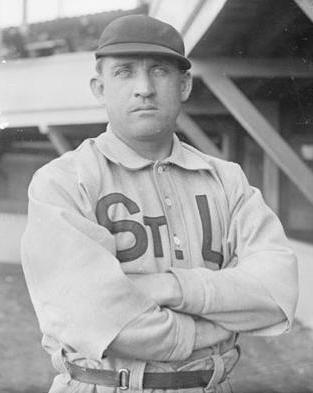 On July 29 the Pirates’ Jack Chesbro fired a three-hit shutout against the Cardinals in St. Louis, while the Pirates pounded Cardinals pitcher Jack Powell for eight runs and 15 hits.9 The game of August 5 in Pittsburgh was a rematch of these starting pitchers, before a crowd of 4,900 at Exposition Park.10 It would be a rough day for Wagner, Chesbro, and the Pirates. The Cardinals added a run in the second inning when Wagner misplayed an easy grounder; he was “too anxious to complete a double play.”14 He made amends in the third inning when he doubled, stole third base, and scored on Bransfield’s sacrifice fly. Burkett made a spectacular catch of the drive to deep left field.15 In the fourth inning, he made another “splendid catch ... when he gathered in Chesbro’s long fly.”16 The Cardinals scored a run in the sixth, and the Pirates led 5-4 after six innings. Burkett knew that Bones Ely was immensely popular with the Pittsburgh fans, and that they would not tolerate many errors by Wagner at short. When Powell batted in the seventh inning, Burkett shouted to him to “hit it down to short and hear the crowd yell for Ely.”17 When Burkett came to bat, he grounded the ball to Wagner and reached safely when Wagner’s throw to first was in the dirt. Seeing the ball on the ground, Burkett kicked it into the outfield and headed for second base, but an umpire saw what he did and called him out.18 The Cardinals scored three runs in the inning to take a 7-5 lead. Depending on whom you were rooting for, Burkett was either a hero or a villain. The Pirates won the 1901 NL pennant, and the Cardinals finished in fourth place, 14½ games behind. Burkett led the league with a .376 batting average and 142 runs scored. Wagner was fourth in the league with a .353 average. 1 St. Louis Republic, June 18, 1901. 2 St. Louis Republic, July 31 and August 4, 1901. 3 St. Louis Republic, April 29, 1901. 4 Brooklyn Daily Eagle, July 3, 1901. 5 St. Louis Republic, May 8, 1901. 6 Dennis DeValeria and Jeanne Burke DeValeria, Honus Wagner: A Biography (New York: Henry Holt, 1995). 7 Pittsburgh Daily Post, July 31, 1901; Pittsburgh Gazette, August 5, 1901. 8 Lawrence S. Ritter, The Glory of Their Times: The Story of the Early Days of Baseball Told by the Men Who Played It (New York: Vintage Books, 1985). 9 St. Louis Republic, July 30, 1901. 10 Pittsburgh Daily Post, August 6, 1901. 11 Pittsburgh Gazette, August 6, 1901. 13 Pittsburgh Daily Post, August 6, 1901. 14 Pittsburgh Gazette, August 6, 1901. 19 St. Louis Republic, August 4, 1901. 20 Pittsburgh Daily Post, August 6, 1901. 21 St. Louis Republic, August 6, 1901.